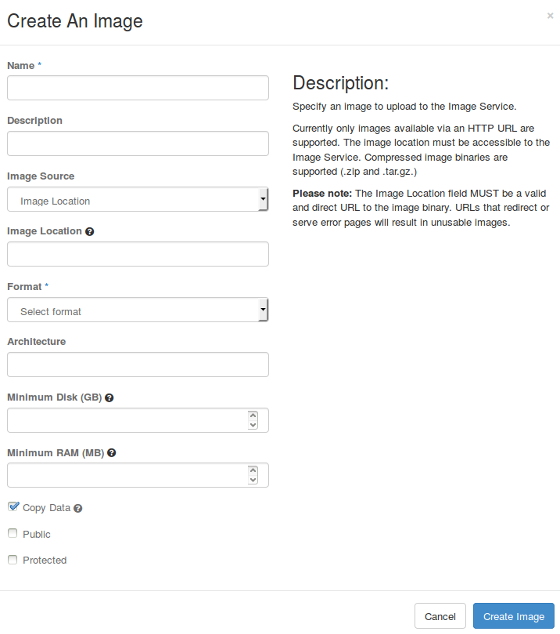 To create and manage images in specified projects as an end user, see the upload and manage images with Dashboard in OpenStack End User Guide and manage images with CLI in OpenStack End User Guide. On the Admin tab, open the Compute tab and click the Images category. The images that you can administer for cloud users appear on this page. Click Create Image, which opens the Create An Image window. Enter a brief description of the image. Choose the image source from the dropdown list. Your choices are Image Location and Image File. Based on your selection, there is an Image File or Image Location field. You can include the location URL or browse for the image file on your file system and add it. Specify the architecture. For example, i386 for a 32-bit architecture or x86_64 for a 64-bit architecture. Specify this option to copy image data to the Image service. Select this option to make the image public to all users. Select this option to ensure that only users with permissions can delete it. On the Admin tab, open the Compute tab and click the Images category. In the Edit Image window, you can change the image name. Select the Public check box to make the image public. Clear this check box to make the image private. You cannot change the Kernel ID, Ramdisk ID, or Architecture attributes for an image. In the Confirm Delete Images window, click Delete Images to confirm the deletion.